Most people live in a constant state of fear and worry without even knowing it. In fact, so many factors affect our emotional state that it can be difficult to know what neutrality feels like. These factors can be broken down into external and internal influences. When thinking about external influences, media outlets are the main players, bombarding our lives with fear-mongering stories about terrorism, health epidemics, natural disasters, and global warming. Their purpose is not to inform us of the latest events and information, but to ensure maximum drama, and therefore maximum ratings and sales. Internal influences include how the brain is hardwired, the environment we grew up in, and the experiences we’ve had. Together, internal and external influences unconsciously shape how we think about and respond to fear in our day-to-day lives. 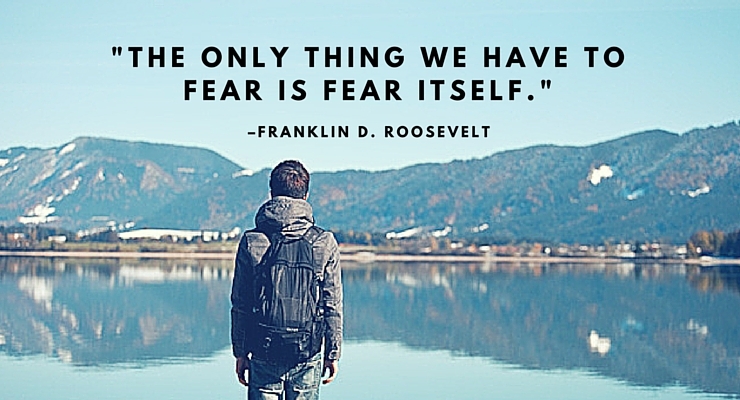 Knowing this, it’s not surprising that so much of what we think about fear is actually not what ‘we think’ at all. In reality, we have very little say in it. To better understand why that is and find out what we can do to regain control and re-calibrate our fear response, we need to first hold a mirror up to ourselves. The way we treat others is often a great marker for understanding how we treat ourselves. Think about it. When you are confronted by the emotions of others, how do you react? If someone is upset, do you help them work through the pain? Or do you avoid it and act like nothing is wrong? Meta-emotions are the feelings we have about feelings. They are what make us respond to emotions like sadness, fear, and anger—in others and ourselves—in a dismissive or accepting way. We develop our meta-emotions during our youth, growing up to either suppress our emotions, express them to the fullest, or feel and control them. The problem with meta-emotions is that they act as part of our gut response; the same response that makes us believe we should be scared when we see a snake in a movie. Of course it has it’s uses, such as in fight or flight situations, but the body overuses the gut response out of ease. For instance, the rule of typical things—as described in the snake example—is a mechanism that causes the body to react in similar ways to situations or things which have similar characteristics. In life, it helps us make safe and energy-conserving decisions, avoiding anything that could involve too much thinking or hard work. Leaving decisions up to the our gut response can prolong our chances of survival, but it doesn’t do anything for our quality of life. By recognizing our meta-emotions, we can better understand and even change our gut reaction to fear. A response to stamp fear out is clearly troublesome, but likewise embracing it to the full can also cause problems. The first step is the hardest—becoming aware of your response. Once you do that, you can switch to conscious thinking and assess the problem logically. When it comes to our emotions and decision-making processes, the gut response isn’t so good at calculating how much fear we need. Conscious thought is how we as rational beings think problems and situations through to arrive at measured and appropriate responses—it’s what separates us from other animals. But switching to and making use of conscious thought is a slow, manual process which requires much more energy, thus we don’t make a habit of doing it. It’s much easier to walk away from a situation out of fear, than it is to confront the feeling head on and assess the actual level of risk. But if we identify our meta-emotion—whether it is dismissive or accepting—and see the situation on an individual basis rather than falling for the rule of typical things, we are already switching from our gut response into conscious thought—almost always leading to a decreased level of fear and a more favorable response. Many experiences in our lives are passed by due to unconscious responses or reactions—often fueled by fear. By not leaving your decisions up to gut feelings (external and internal influences), and giving yourself time to judge the situation at hand, you can redefine your idea of fear and do things which you once believed you never could.